This article is about Roman Milan. For other uses, see Mediolanum (disambiguation). A section of Roman wall (11 m high) with a 24-sided tower. Mediolanum, the ancient Milan, was originally an Insubrian city, but afterwards became an important Roman city in northern Italy. This article charts the history of the city from its settlement by the Insubres around 600 BC, through its conquest by the Romans and its development into a key centre of Western Christianity and capital of the Western Roman Empire, until its decline under the ravages of the Gothic War, its capture by the Lombards in 569, and their decision to make Ticinum the capital of their Kingdom of Italy. 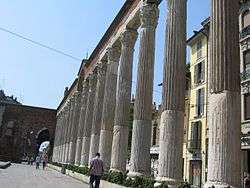 During the Principate 200 AD the population was 40,000; when the city became capital of the Western Roman Empire from emperor Maximian (286-305) on the population rose to 100,000 people and thus Milan became one of the largest cities in Roman Italy. Mediolanum appears to have been founded around 600 BC by the Celtic Insubres, after whom this region of northern Italy was called Insubria. According to the legend reported by Livy, the Gaulish king Ambicatus sent his nephew Bellovesus into northern Italy at the head of a party drawn from various Gaulish tribes; this Bellovesus was said to have founded Mediolanum (in the time of Tarquinius Priscus, according to this legend). The Romans, led by consul Gnaeus Cornelius Scipio Calvus, fought the Insubres and captured the city in 222 BC; the chief of the Insubres submitted to Rome, giving the Romans control of the city. 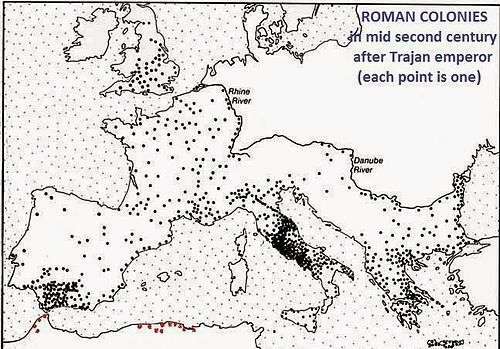 They eventually conquered the entirety of the region, calling the new province Cisalpine Gaul— "Gaul this side of the Alps"— and may have given the site its Latinized Celtic name: in Gaulish *medio- meant "middle, center" and the name element -lanon is the Celtic equivalent of Latin -planum "plain", thus *Mediolanon (Latinized as Mediolanum) meant "(settlement) in the midst of the plain". Ruins of the Emperor's palace 45°27′54.43″N 09°10′50.15″E﻿ / ﻿45.4651194°N 9.1805972°E﻿ / 45.4651194; 9.1805972 in Milan. Here Constantine and Licinius issued the Edict of Milan. Mediolanum was important for its location as a hub in the road network of northern Italy. Polybius describes the country as abounding in wine, and every kind of grain, and in fine wool. Herds of swine, both for public and private supply, were bred in its forests, and the people were well known for their generosity. 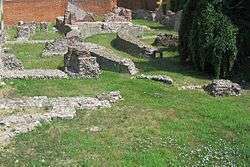 During the Augustan age Mediolanum was famous for its schools; it possessed a theater and an amphitheatre (129.5 X 109.3 m). A large stone wall encircled the city in Caesar's time, and later was expanded in the late third century AD, by Maximian. Mediolanum was made the seat of the prefect of Liguria (Praefectus Liguriae) by Hadrian and Constantine made it the seat of the vicar of Italy (Vicarius Italiae). In the third century Mediolanum possessed a mint, a horreum and imperial mausoleum. In 259, Roman legions under the command of Emperor Gallienus soundly defeated the Alemanni in the Battle of Mediolanum. In 286 Diocletian moved the capital of the Western Roman Empire from Rome to Mediolanum. He chose to reside at Nicomedia in the Eastern Empire, leaving his colleague Maximian at Milan. Maximian built several gigantic monuments, the large circus (470 x 85 metres), the thermae or "Baths of Hercules", a large complex of imperial palaces and other services and buildings of which fewer visible traces remain. Maximian increased the city area surrounded by a new, larger stone wall (about 4.5 km long) encompassing an area of 375 acres with many 24-sided towers. 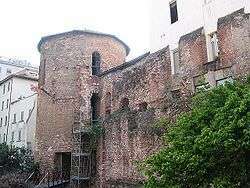 The monumental area had twin towers; one that was included in the convent of San Maurizio Maggiore remains 16,60m high. It was from Milan that the Emperor Constantine issued the Edict of Milan in 313 AD, granting tolerance to all religions within the Empire, thus paving the way for Christianity to become the dominant religion of the Empire. Constantine was in Milan to celebrate the wedding of his sister to the Eastern Emperor, Licinius. There were Christian communities in Mediolanum, which contributed its share of martyrs during the persecutions, but the first bishop of Milan who has a firm historical presence is Merocles, who was at the Council of Rome of 313. In the mid-fourth century, the Arian controversy divided the Christians of Mediolanum; Constantius supported Arian bishops and at times there were rival bishops. Auxentius of Milan (died 374) was a respected Arian theologian. At the time of the bishop St. Ambrose (bishop 374-397), who quelled the Arians, and emperor Theodosius I, Mediolanum reached the height of its ancient power. The city also possessed a number of basilicas, added in the late fourth century AD. These are San Simpliciano, San Nazaro, San Lorenzo and the chapel of San Vittore, located in the basilica of Sant'Ambrogio. In general, the Late Empire encouraged the development of the applied arts in Mediolanum, with ivory and silver work being common in public building projects. In the fourth century AD. In the crypt of the Duomo survive ruins of the ancient church of Saint Tecla and the baptisty where St. Augustine of Hippo was baptized. In 402, the city was besieged by the Goths and the Imperial residence was moved to Ravenna. In 452, it was besieged again by Attila, but the real break with its Imperial past came in 538, during the Gothic War, when Mediolanum was laid to waste by Uraia, a nephew of Witiges, King of the Goths, with great loss of life. The Lombards took Ticinum as their capital (renaming it ‘Papia’, hence the modern Pavia), and Early Medieval Milan was left to be governed by its archbishops. the so‑called "Tomb of Stilicho", assembled from a Roman sarcophagus and other material. a large collection of inscriptions. the Colonne di San Lorenzo, a colonnade in front of the church of S. Lorenzo. Roman lapidary material in the Archi di Porta Nuova. the scant remains of a large amphitheatre, now in an archaeological park dedicated to their preservation. a tower (16.6 m high) of the circus, now inside the Convento di San Maurizio Maggiore. the church of San Lorenzo (IV-V sec.) and the San Aquilino chapel. ruins of the imperial palace. some ruins from the Baths of Hercules; further remains of ceilings and floors are in the archaeological museum. the body of St. Ambrose (d. 397) and those possibly of SS. Gervasius and Protasius — or at any rate, of earlier men, found in St. Ambrose's time, are still seen in the crypt of the church of S. Ambrogio. a bit of the moenia and some remnants of pavements in piazza Missori and in the namesake station of Milan Metro. ↑ Benario, Herbert W. (1981). "Amphitheatres of the Roman World". The Classical Journal. 76 (3): 255–258. JSTOR 3297328. Measurements as given p. 257; it was not, as is sometimes claimed, the third largest in the world after the Flavian Amphitheatre in Rome and the vast amphitheatre in Capua. ↑ Though Trajan Decius may have struck coinage at Mediolanum, the sequence begins with Gallienus, c 258; the mint at Mediolanum, transferred to Ticinum by Aurelian, ranked with Rome and Siscia (modern Sisak in Croatia) as one of the three great mints of the Empire. Mattingly, H. (1921). "The Mints of the Empire: Vespasian to Diocletian". Journal of Roman Studies. 11: 254–264 [p. 259]. doi:10.2307/295905. ↑ There were Milanese cults of Saints Gervasius and Protasius, St. Victor Maurus (304), Sts. Nabor and Felix, and Sts. Nazarius and Celsus and the legendary Saint Sebastian. Polybius (1889). Histories. London, New York: Macmillan. Thurston Peck, Harry (1898). Harpers Dictionary of Classical Antiquities. New York: Harper and Brothers. MacDonald Stillwell, Richard; William L. McAlister; Marian Holland (1976). The Princeton Encyclopedia of Classical Sites. Princeton: Princeton University Press. Wikimedia Commons has media related to Milano.